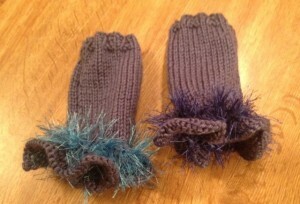 After making the ruffled leg warmers I wanted to make a matching pair of ruffle fingerless gloves. 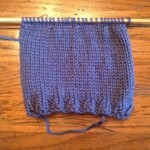 Using the leg warmer pattern as my base – I was able to make a pattern. I decided to add some fun fur to the gloves and am so glad that I did. I really like these and think I need to readjust the pattern for an adult size! I used a blue hue fun fur yarn – so one glove is lighter blue fun fur and the other a darker hue of blue – both Stella and I thought it made them look cool. 2. 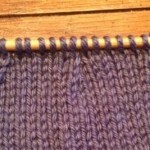 Work in ribbing (K2, P2) for 4 rows. 3. 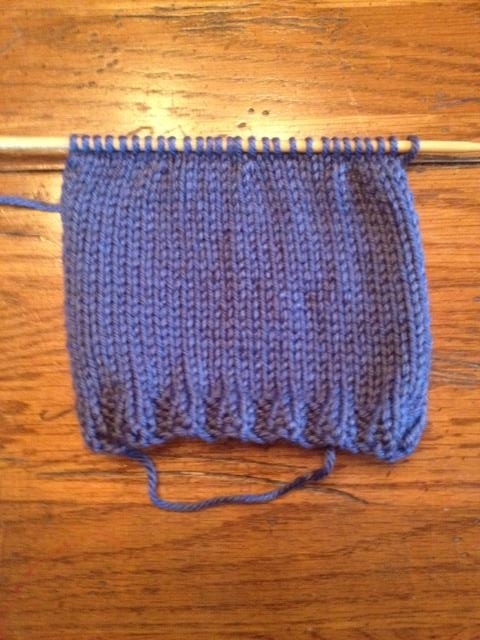 Work in stockinette (knit one row, purl one row) for 3 1/2″ End with a purl row. 4. 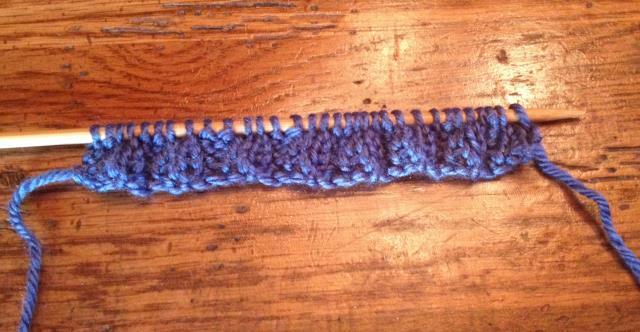 RS (right side): *K6, K2tog (knit 2 together) repeat from * to end of row. 6. *K5, K2tog, repeat from * to end of row. 8. 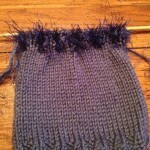 Adding your fun fur (knitting with a strand of yarn and a strand of fun fur) work in ribbing (K2, P2) for 5 rows. 9. 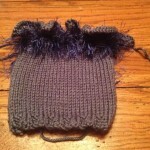 Cut your fun fur yarn. 11. 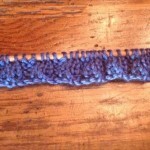 Kfb (knit front and back of each stitch) in every stitch across the row. 13. Kfb in every stitch across the row. 17. 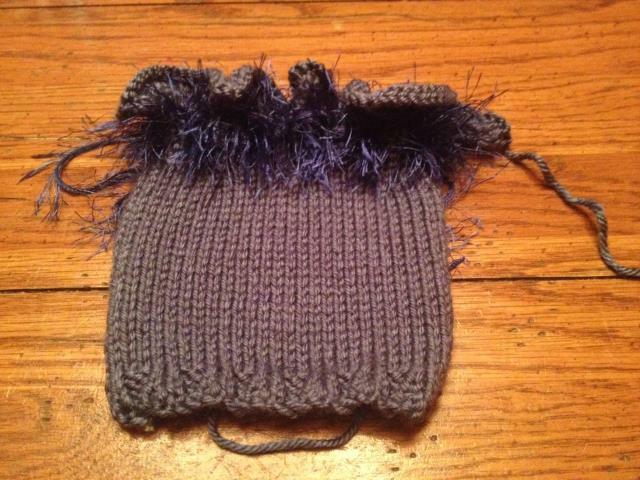 With right sides together sew up the seam, starting at the ruffle end. Sew seam for 4 1/4″. 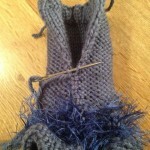 Leave a 1 inch space, weaving the yarn into the gloves and then sew the rest of the seam. The opening is for the thumb. 18. 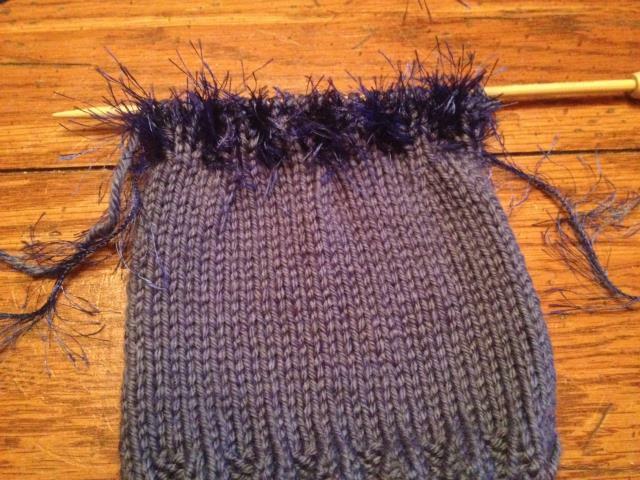 Weave in all ends using a darning needle. I had Stella model these and she asked if they were really a gift – I think that was a hint that she would like a pair! 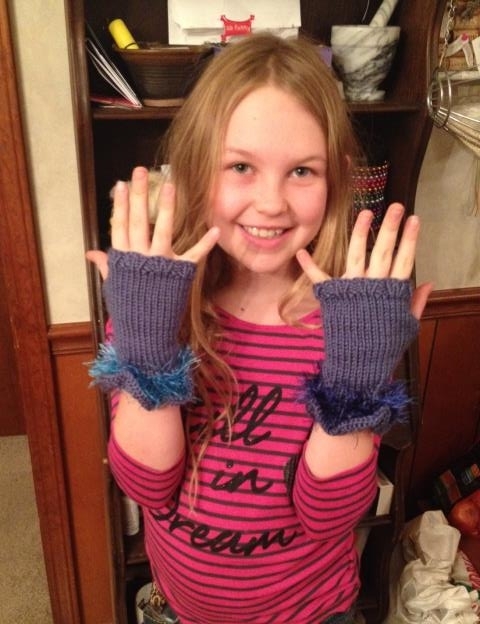 This entry was posted in Crafts, Knitting and tagged childrens, fingerless gloves, knitting, pattern. Bookmark the permalink. Stella would definitely need a pair. 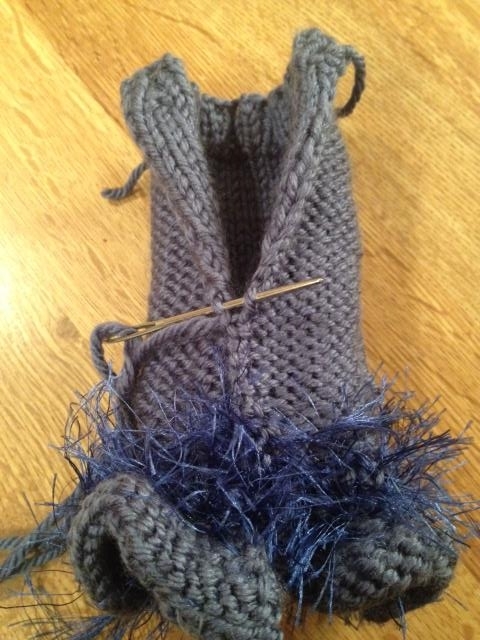 Good photos of the fingerless gloves. Those receiving these will love them!! Purple gloves on Stella, a great combination! Very cute.